The Presbyterian Church of Cadiz will celebrate its 200th anniversary with monthly events that will look back at 30- to 50-year segments of its history. In 1817, the Rev. John Rea stood underneath a group of oak trees in what is now Cadiz, Ohio, and preached a sermon to anyone who would listen. From that sermon sprung two Presbyterian churches that would stand a block apart for the next century and a half, sending missionaries to different parts of the world and, just as importantly, reaching out to their own community to provide support. It’s been a joyous and fulfilling 200 years for the now merged Presbyterian congregation that resides on West Market Street in Cadiz. Because of its past, and since a bicentennial is certainly cause for celebration, the Presbyterian Church of Cadiz is honoring its history with a five-part series this summer that will take guests back in time to relive some of the traditions and legacy of a congregation that still counts 200 people among its membership. Erica, who is in her second year as the head of staff at Cadiz Church, is coordinating the five-part history series that will be held in the evening on the first Sunday of the month from June to October, which translates into Pentecost Sunday to World Communion Sunday. Each service will look back at 30- to 50-year segments of the church and highlight special moments during that time period. Communion tokens were brought back for part of Cadiz Church’s 200th anniversary celebration. The July celebration will have a “Road to Freedom” theme that will concentrate on the split among Presbyterians over slavery. Featured will be a debate between abolitionists and those who felt that well-treated slaves who were placed into a free world would eventually struggle. Post-Civil War changes in society will be the focus of the August gathering at Cadiz Church. This evening will include a tour of the local cemetery, which has Civil War-era graves and was also the location of one of the church’s early buildings. September will consist of the pre-Great Depression period when the church sent 30 members into the mission field to places like Japan and Egypt. One of the congregation’s former missionaries who has served in Egypt and Lebanon will be on hand to tell her story. During that time period communion was regularly served using rice and goat milk, and that is being considered as an option for this celebration. Pew rents were also the norm in the early 1900’s, something that may be brought back for this special service as well. Also during this era, the church produced its first cookbook, and that 1920 publication will be used to create meals for a potluck dinner, using the exact ingredients as detailed in the cookbook. A grandmother’s diary will also be read to get some unique perspectives on the life of the church during that era. The Cadiz Church is located in the former Trinity Church building. The Grace Church structure, which is currently a thrift shop, was gutted by fire in 1944 but was rebuilt in 1948 and used until the 1967 merger. A tornado in 1954 also caused destruction, knocking out the rear wall and the roof, but somehow the church’s Tiffany window was undamaged. Rev. McInroy was also a leader in establishing Camp Presmont on Piedmont Lake where youth come to learn about Christian love and teaching. That type of youth outreach was mirrored by the Cadiz Church through an after-school homework club it hosted over the years. This summer, a youth lunch program was started as another way to fulfill its community outreach initiative. “Many people in the church have been involved in civic activity around the community through the years,” Erica added. 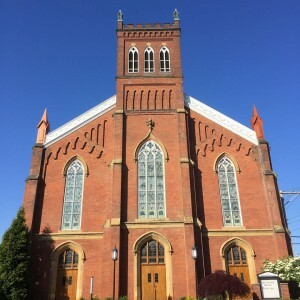 Cadiz Church is also known for having a traditional worship service on Sunday mornings, something that is not the norm in this small Ohio town. And that’s a good thing. It’s created a relationship with a congregation that has withstood many hardships and events to prosper and thrive 200 years later.